When people bemoan the fact that they can’t eat gluten, I like to remind them about chocolate. We still have chocolate. Except, it’s not that simple. The cacao bean is gluten-free, of course. However, some good chocolates might be cross-contaminated with gluten from other sources in the factory. (I’m still mourning the fact that the Valrhona website suggests that people for whom gluten is a health issue not eat their chocolate.) I have to check the label of every chocolate bar to ensure I won’t grow sick with one bite of that dark luscious stuff. And of course, many of us who are gluten-free also have other food intolerances or allergies. I can’t imagine how hard it must feel to be allergic to soy and want some chocolate. So many chocolates contain soy lecithin. And frankly, almost all the “allergy-free” chocolates I have tasted have been lifeless versions of their intended ideal. This is why we love PASCHA chocolate. We’d like to introduce you to our latest sponsor. PASCHA makes truly good chocolate, dark and sensuous, full of cacao bean flavor, ranging from 55% to 80% dark chocolate. This chocolate is organic, fair-trade, and contains no GMO products. Best yet, it is free from gluten, nuts, dairy, soy, and even potential allergens such as fish and eggs. It’s produced in an entirely allergen-free facility. And you have to love a chocolate company that has a clearly expressed chocolate philosophy. We are big fans of PASCHA chocolate. We’d like to let you hear more from PASCHA Founder, Simon Lester. I started my working life in the chocolate business in the UK. Chocolate has always been a passion of mine. I wanted to created PASCHA to offer ultra-pure delicious chocolate that is safe for anyone to eat. I was also intrigued by the health aspects which dark chocolate offers (very high antioxidants) with many reported benefits (blood pressure, positive moods, etc) which people are looking for. I felt chocolate should be made without unnecessary ingredients like soy lecithin. I wanted people with allergies or without to enjoy a pure, terrific piece of ORGANIC, NON-GMO chocolate. Why have you taken the care to make these chocolates allergy free? I realized how life threatening and altering food allergies can be when one of my daughters had an anaphylactic reaction to food. Then the penny dropped that someone really needed to come out with a completely allergen-free, great-tasting organic chocolate. While most people don’t think of chocolate and allergies, the reality is that almost every chocolate plant in the western world uses milk, various tree nuts, peanuts, soy and often wheat, gluten and egg. Because of the difficulties of cleaning a chocolate manufacturing plant once these ingredients are inside the plant, a residual amount is left behind – which is the danger point for people with food allergies. Did you have to sacrifice anything to make the chocolates allergy free? Absolutely not! The more impurity you take out of chocolate the purer it becomes and the more you just taste the cocoa bean. That’s what makes fantastic chocolate. Can you tell us a story of a customer who was excited to find your chocolates? Talking with our passionate customers is amazing. At a gluten-free show in Chicago, a woman came up to me and said that she had not eaten chocolate for 3 years because of food allergies. There was literally nothing on the market that she could eat. She just thanked me for creating PASCHA. Everyday, people email us their list of food allergies, fearful that they will not be able to eat our bars. It is a great feeling to email them back – PASCHA is safe and please enjoy it! Do you have a recipe you love using these chocolates? These soft cookies serve up a delicious pairing of sweet and tart can be enjoyed warm or at room temperature. You can adjust the level of tartness by adding/removing some of the rhubarb. The cookies are most delicious when eaten within 2 days; but don’t worry they will be gone long before that! 2. Using an electric mixer, whip the shortening, sugar, vanilla, maple syrup and applesauce. 3. Next, mix in your gluten free flour. Blend on low until mixed throughly. melted add chocolate to the mixer. Blend. 5. Gently, by hand, fold in remaining chocolate chunks and rhubarb. 6. Using a teaspoon, scoop dough balls onto a lightly oiled baking sheet or baking mat. 8. Let cookies rest 5 minutes on the cookie sheet before moving. This recipe has a lot of flexibility. You can chop the rhubarb finely so that its not as chewy or to make it more discrete looking when your kids grab a cookie. You can also do the same for the chocolate, if you prefer a less chunky cookie. You can shape the cookies round or flat. PASCHA chocolate is offering chocolate to three lucky readers of our site. Please leave a comment about why you would like to try PASCHA chocolate. I would love to try PASCHA chocolate. I am a major lover of dark chocolate (only) and I have been gluten-free for 14 years and have remained faithful to eating healthy. Shauna, I am an avid fan of yours! I also had the pleasure of speaking with you during a radio interview on a local station in Phoenix. I love your books (& have one) and first found your blog many years ago and knew we were kindred spirits. You rock big time! God bless you and your family and all your success. We can’t have dairy or gluten, and do our best to avoid soy whenever possible. I used to be a chocolate a day kind of gal but now our only chocolate is anything we make from scratch with cocoa powder. I’d love to a REAL chocolate bar again! I love great chocolate. I would love to try this kind! Wow- gluten free and dairy free! This would be a treat at Easter. Not looking forward to a chocolate-free Easter for my family. I spend a ridiculous amount of time in the chocolate aisle of every store I enter, trying to find a good new gluten-free chocolate. I’d love to try this one! I consider chocolate a food group and would love to try this. LOVE super-dark chocolate…would love to try! We love really dark 85% chocolate (especially with a glass of nice red wine). One of our favorite chocolate recipes is Cook’s Illustrated’s fallen chocolate cakes — easily made gluten free with almond flour. re: the g-f flour, “including xanthan gum”‘; I assume psyllium husk could be substituted…..
Because I miss chocolate! I love chocolate! Wonderful news! Finding gluten free, dairy free chocolate has just made my day. Thanks to both you and Pascha for this great give away. Any hints as to where to buy this delectable delicious drooly treat? I have never heard of this brand, but if it’s that good I’d love to try it! mmmmmm chocolate with no dairy and fair trade too! I’ll have to keep my eye out for Pascha. I’m always on the hunt for new dark chocolates to try! This chocolate sounds amazing! I would love to try it because it is free of allergens and is something that I can eat and enjoy. It is so hard to find chocolate that is both dairy and gluten free, I thought my family would never again be able to enjoy the sweet snack. I’m excited to know Pascha is here to save the day! I can’t wait to try it. I don’t enjoy milk chocolate – usually too sweet. I don’t enjoy dark chocolate – usually too bitter. I really enjoy that in between chocolate (55% or so). I had found one I really liked but the company stopped making it. 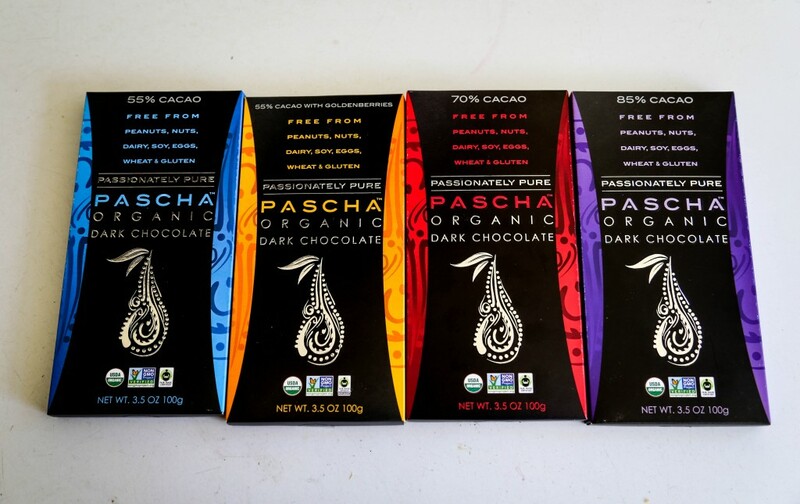 I would love to try Pascha’s chocolate, especially the mid-range cacao! Oh, yes please!! As I am gluten and soy free due to allergies, and my child is nut free – finding chocolate that we can eat (and enjoy) is challenging! We would be thrilled to try this chocolate! What an awesome giveaway! Yes, please! I have only found one brand of certified gluten-free, vegan, organic chocolate at the stores near me – and they usually only sell the plain dark bars. I would love to try PASCHA’s bars with coffee and goldenberries! Is there really any question about why one would like to try Pascha chocolate? I’ve tried almost every kind of chocolate there is – I would love to try a safe delicious chocolate!! This chocolate sounds wonderful…. I am always looking for a good gluten-free chocolate. I have to try this one! Chocolate is a staple in my restricted diet and how exciting to discover through GFG this product so pure, so divine! Why do I want to win a bar of PASCHA dark chocolate? Because I LOVE dark chocolate of course. Yes, please pass the PASCHA dark chocolate! Thank for the chance to win some. I would love to try Pascha chocolate. I remember going to Switzerland a few years ago and not being able to eat any chocolate – we went to a chocolate factory and every single product made said ‘may contain traces of gluten’ on the packet (not to mention nuts and other things I can’t eat!). The smell of all that chocolate and not being able to eat any of it was a nightmare. because I want to try that cookie recipe! I just want my chocolate without all those unnecessary ingredients added. I would love to try Pascha Chocolate! I’m actually allergic to gluten, soy and corn so finding a satisfying chocolate that doesn’t serve as a constant reminder is a challenge. I love dark chocolate.I can’t have gluten or soy and I obsessively read chocolste labels trying to find safe treats…hard to find. Love to try yours. I would love to try a safe GF chocolate that dairy-free and produced in an allergen-free environment! Looks really intriguing. I would like to try it so I who am gluten free can share it with a friend who is soy free. I have chocolate I can eat but so far no (good) soy free chocolate. What a treat this would be; gluten has always been off for me, but in recent years dairy was rejected by my body as well. Finding safe treats to enjoy that taste like real food and pronounceable ingredients would be amazing. I’d love to try PASCHA just to see what real chocolate (by real I mean without all the stuff that is added to chocolate just because) should taste like. I’m excited!! And I love dark chocolate. Chocolate runs in my blood. My first memories involve chocolate. my grandfather would buy me chocolate peppermint patties on our walks together as he remembered growing up in a French family that made chocolate and other candies. No milk chocolate for me, I am a dark chocolate eater. I would love a chance to try PASCHA chocolates and not have to worry about gluten hiding inside my chocolate. How many times have people said, “I know you can’t eat… [fill in the blank with one of my six food allergies], so I brought you this!” Then they lovingly extend a bar of poison. It’s made in a facility that, or processed on equipment that also, or the second or third ingredient is on my ‘no’ list. And the rare occasions it escapes those pitfalls, it’s often like licking a chalkboard. On top of my body’s demands, there are the demands of conscience. I’d like to eat food that doesn’t destroy the earth, pollute the water, put us at risk of genetically engineered destruction, or enslave people. Here, at last, chocolate I can eat and enjoy on all levels! Thank you, PASCHA. I will gladly and self-servingly tell all my friends about you. I would love to win this giveaway so that my 10 yr old daughter and I could safely eat PASCHA chocolates without having to worry about hidden ingredients making us sick. I would love to try Pascha chocolate to make a chocolate mousse or chocolate chunk cookies for my preschooler son who has celiac disease. I love to test out GF recipes for him. chocolate is awesome. what is more awesome, is a company dedicated to giving the world a better, purer version than what is generally available. I look forward to trying Pasha Chocolate when I find it – is it sold in Canada? It is SO hard to find good chocolate without soy lecithin!! I would love to try Pascha chocolate! Its tough to find good GOOD chocolate! We would love to try it! I was babysitting my niece, about 26 years ago now, when she had her first allergic reaction to milk at the age of two months. I didn’t know what was happening, only that I had to get her medical attention very quickly. I bundled her up along with my own baby who was a couple of months older. We were lucky. Everything turned out ok. And so began those heart wrenching years of trying to keep a lovely little growing girl safe from multiple and very serious food and environmental allergies. Some people were wonderful and understanding. Others, no so much. Her bus route even had to be changed when a driver said she would refuse to administer the epi pen if my 5 year old niece was stung by a bee. We were grateful that the driver was honest enough to admit this, so that we could all do everything we could to keep her safe. Her class mates learned about the importance of hand washing and what type of foods could be eaten in which class room. Whenever a family member found something “Kayla proof” everyone celebrated the efforts to make growing up as inclusive and normal as possible for her. It was not always easy for her to have “special” cake at a party, or to eat in another room. My niece has grown into a beautiful young woman – inside and out – with whom I love to spend time. With Easter approaching I am excited to have found something special in the Pascha Chocolate that you have introduced on your website that we can share. Thank you.